New Zealand TV Weekly dated April 14, 1969. 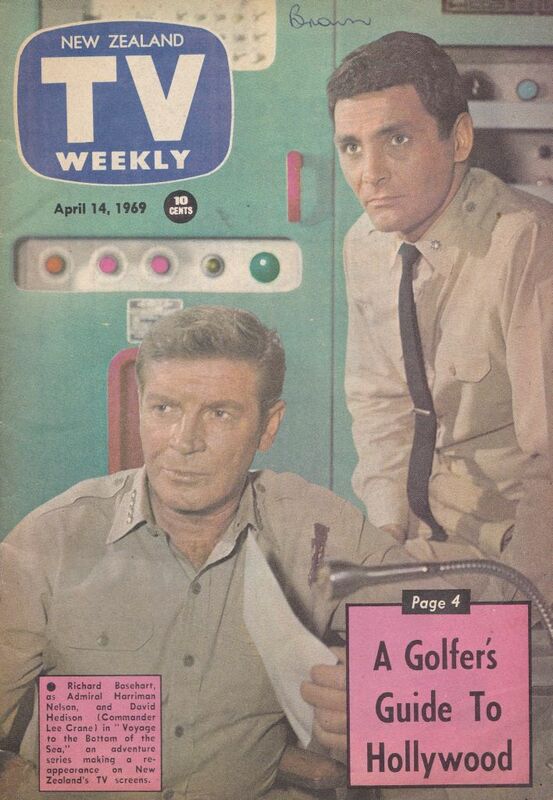 Featuring Richard Basehart & David Hedison on the cover. Inside photos are... Golfers Guide to Hollywood. Ingrid Bergman, The Gals of the TV West, with Linda Cristal, Amanda Blake and Barbara Stanwyck, Lorne Greene (Bonaza), Jill Townsend & Staurt Whitman (Cimarron Strip), Goldie Hawn, George Hamilton, Dorothy Malone, Robert Reed & E.G. Marshall (The Defenders), Bill Cosby (I Spy), Jack Benny, Jonathan Winters, Buddy Ebsen, Ken Berry, Ryan O'Neal. TV Mag is in great condition. Very rare guide to obtain.